Fox is pulling out all the marvelous marketing angles to promote Prometheus. I'm going to register with the site today. Visit Weyland Industries and check out the site. 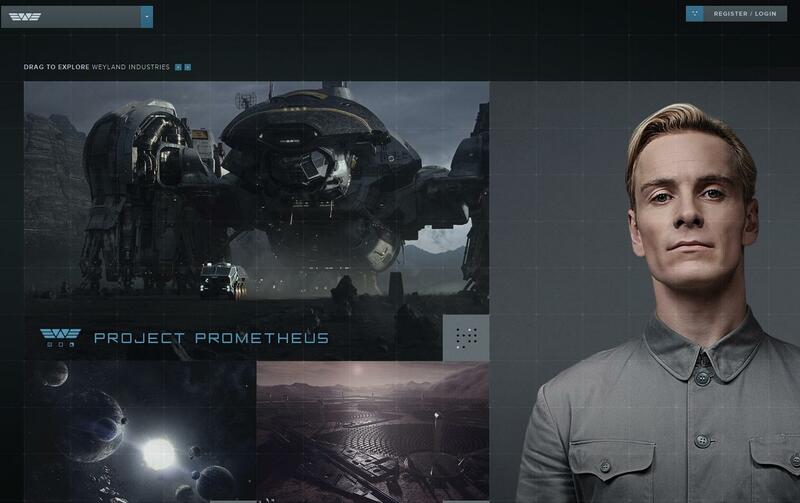 Michael as David 8 is prominently featured on the main page to greet you. Once there, click on David's image to go to his page to learn so much more about him. To ensure that you get your ticket for opening day here in the US on Friday, June 8th, I strongly suggest you stalk Fandango.com and Movietickets.com and jump on ordering your ticket. According to the current poll, a lot of people want to watch Prometheus in IMAX - but those tickets are based on reserved seating (which I dislike), so therefore, as soon as you can buy a ticket, buy it and reserve a great seat! Also, if anyone is interested, FF reader Sidra has a Blu-ray disc of Shame that she cannot use. If you are interested in getting it for free, please email her at ss_silas@yahoo.com. First come, first served Update: A reader in Italy contacted Sidra first and will get the Blu-ray disc. Thanks again Sidra for sharing the Fassy love around the world! This is one of my most anticipated film of the year. Simone have you seen the The Mindy Project tv show trailer?It has a michael fassbender reffrences in it.Quite funny! No, I don't watch TV, but, courtesy of tumblr, I have seen gifs from Mindy's show. The current ones feature her obsessing over Michael. It's funny. Pulling out all the stops indeed. I'm trying to be careful with what I read, because there are some minor spoilers floating around. Oh I refuse to watch anymore trailer videos, and I'm being very cautious while on the net researching for Prometheus stuff. There are people out there who are tossing out theories and speculations that are just too close to what the film is about. I just finished watching the “David8” video on YouTube. Oh. My. Goodness. WOW! It’s kind of cool and creepy at the same time. I can’t wait to see this film. It’s going to be so awesome! Ditto with everyone else on the spoilers - I’ve had to steer clear of Tumblr lately because I’ve had quite a few movies get ruined for me other there. Thanks Simone for this wonderful site! It's been a real pleasure getting to know Michael's work through this site. Thanks Sidra for the disk! And if anyone is interested in seeing Nicole Beharie's film This Is My Last Day Without You, It's available on Amazon.de. It's currently doing small releases and the festival rounds in the States. It came out last year in Germany. She is a really great singer as well as a great actress. You can check out clips of the film on Youtube.